Isn’t it ironic that in a profession that’s become so formulaic you have created the most successful comic strip of the ’80s by not trying to fulfill a formula? But in a way, I’ve ended up with the old tried and true. It’s a strip about a family — a familiar, universal setting that’s easy to identify with. I’m trying to put a unique twist on it, but it’s well-covered ground. The trend nowadays in comics seems to be to zero in on a narrow, specific audience, like divorced parents, baby boomers, and so on. I guess the idea is to attract a devoted special interest group to the comic page who will scream if the strip is ever dropped. That way, the strip stands a better chance of survival than a strip that aims wide but doesn’t hit deep. Generally, I don’t like these trend-of- the-month strips because they’re usually the product of some market analysis rather than the product of any honest artistic sensibility on the part of the cartoonist. Still, with any strip, it’s not the subject that’s important: it’s what you do with it. A family strip can be hackneyed drivel just as easily as any other kind of strip. Let’s talk about Hobbes a little bit. He seems to be older and wiser than Calvin, but not much. Which of the following more accurately describes him: a pet, a brother, a friend, or the father that Calvin never had? Hobbes is really hard to define and, in a way, I’m reluctant to do it. I think there’s an aspect of this character that’s hard for me to articulate. I suppose if I had to choose from those four, the brother and the friend would be the closest. But there’s something a little peculiar about him that’s, hopefully, not readily categorized. Well, in a way that says more about Calvin than Hobbes because Hobbes is implicitly, explicitly just a product of his imagination. But the strip doesn’t assert that. That’s the assumption that adults make because nobody else sees him, sees Hobbes, in the way that Calvin does. Some reporter was writing a story on imaginary friends and they asked me for a comment, and I didn’t do it because I really have absolutely no knowledge about imaginary friends. It would seem to me, though, that when you make up a friend for yourself, you would have somebody to agree with you, not to argue with you. 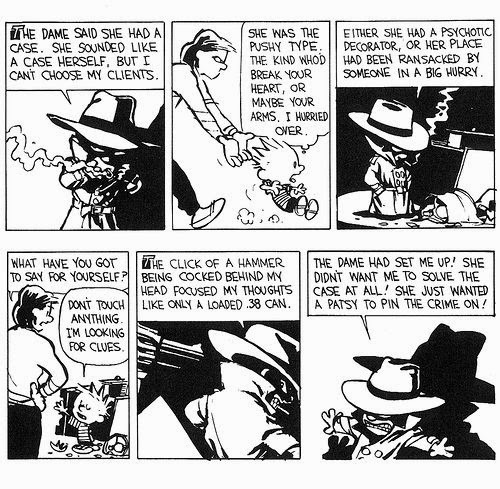 So Hobbes is more real than I suspect any kid would dream up. You do a lot with the visuals of the strip. Do you make a conscious effort to vary the visual, as well as the storylines? I enjoy the drawing more than the writing, so I try to think of ideas that will allow me to develop the visual side of the strip as fully as possible. Some ideas don’t lend themselves to that. Even then, I try to make the drawings as interesting as I possibly can, given the very limited constraints of the format. In other words, if I’ve got essentially two characters talking in a daily, I’ll try to put them in an interesting location, have them walking through the woods. I’ll try different perspectives. If I’ve got several days’ strips that are essentially talking strips, one day I’ll eliminate all background, have it as sparse and clean as I can; the next day, try to make it a little lusher or develop the setting more. This is probably done more out of boredom than any conscious decision to do this one day and do this another day. The Sundays are the one day that I have a little more freedom with the visual aspects. The fun of a Sunday is that I have more space. Sunday strips lend themselves to longer conversations or visual things or, best of all, both: although if you have much conversation then you don’t have room for much visual. Sundays are more consciously chosen to reflect those two interests. Basically, I’ve decided that licensing is inconsistent with what I’m trying to do with Calvin and Hobbes. I take cartoons seriously as an art form, so I think with an issue like licensing, it’s important to analyze what my strip is about, and what makes it work. It’s easy to transfer the essence of a gag-oriented strip, especially a one-panel gag strip, from the newspaper page to a T-shirt, a mug, a greeting card, and so on. The joke reads the same no matter what it’s printed on, and the joke is what the strip is about. Nothing is lost. My strip works differently. Calvin and Hobbes isn’t a gag strip. It has a punch line, but the strip is about more than that. The humor is situational, and often episodic. It relies on conversation, and the development of personalities and relationships. These aren’t concerns you can wrap up neatly in a clever little saying for people to send each other or to hang up on their walls. To explore character, you need lots of time and space. Note pads and coffee mugs just aren’t appropriate vehicles for what I’m trying to do here. I’m not interested in removing all the subtlety from my work to condense it for a product. The strip is about more than jokes. I think the syndicate would admit this if they would start looking at my strip instead of just the royalty checks. Unfortunately, they are in the cartoon business only because it makes money, so arguments about artistic intentions are never very persuasive to them. I have no aversion to obscene wealth, but that’s not my motivation either. I think to license Calvin and Hobbes would ruin the most precious qualities of my strip and, once that happens, you can’t buy those qualities back. Well, what about something like a doll? That’s not a product like a coffee mug, which would be there whether the strip characters were printed on it or not. Why doesn’t a doll fit into your definition of appropriate licensing? A doll communicates even less of the strip than the things mentioned before. A doll only cashes in on the recognizability of the character. Products like that take the character out of the world for which he was intended. If you stick 30 Hobbes dolls on a drugstore shelf, you’re no longer talking about a character I created. At that point, you’ve transformed him into just another overpriced knickknack. I have no interest in turning my characters into commodities. If I’d wanted to sell plush garbage, I’d have gone to work as a carny. The idea of a Hobbes doll is especially noxious, because the whole intrigue of Hobbes is that he may or may not be a real tiger. The strip deliberately sets up two versions of reality without committing itself to either one. If I’m not going to answer the question of who or what Hobbes is, I’m certainly not going to let Dakin answer it. It makes no sense to allow someone to make Hobbes into a stuffed toy for real, and deprive the strip of an element of its magic. You mention size. What’s all the fuss about the size of comic strips? The size issue is crucial to anyone who cares about quality in cartoons. To save space, newsprint, and money, newspapers have been reducing the size of comics for years. It has gotten to the point now, where cartoons can no longer do what they do best. Comic strips are words and pictures, but there is little room for either any more. Most cartoonists, to make their work legible at tiny reproduction, have eliminated panels, line-work, and words, and the result is a drastic loss in character development, storytelling ability, and intelligent humor. A beautiful strip like Pogo would be impossible to read at today’s sizes. Adventure strips are dead. Comics have been deprived of much of their ability to entertain. Now we have a lot of talking heads and gags that could be read with equal effect on the radio. The visual attraction of the comics is largely a thing of the past. Until something is done to restore the size of comics, they will only continue to get more insipid, and have less pull on their audiences. To save a few inches of space, newspapers are killing the appeal of comics. Unfortunately, the syndicates and cartoonists are afraid newspapers would drop strips rather than add space if cartoons were printed larger, so few are willing to take a stand on this issue. Nobody wants to lose his strip over a few little picas. 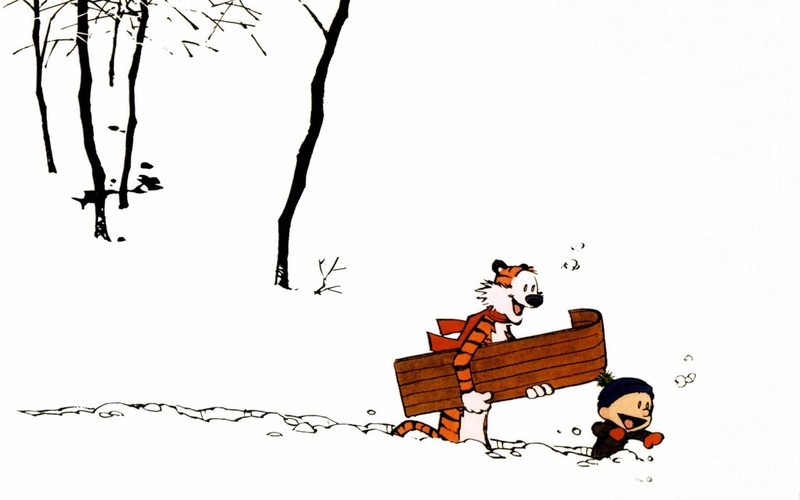 Before Calvin and Hobbes, you submitted four or five comic strips to the syndicates, the later ones being kind of training grounds for Calvin and Hobbes. How do you look back on that time? When I was sending the strips out, I looked no farther forward than getting interest from the syndicate, so in drawing up three weeks’ or four weeks’ material I would hope to show enough versatility and enough basic competence in writing and drawing skills that would interest them. But I lacked foresight in thinking about the depth of the characters and whether they would actually be able not only to continue but expand as they went on. I think that’s probably the mistake that many would-be cartoonists make, that their characters are vehicles for gags, rather than distinct personalities that can grow and develop over the years. It was a learning process. You can’t learn to stand up and walk without falling down a lot, so it’s very fortunate that I was able to do that without anybody seeing these strips except friends. Well, one thing that you didn’t do out of the public spotlight was editorial cartoons, professionally, for six months, with The Cincinnati Post. How do you think back on that experience? The experience itself was horrible, but getting fired forced me to reexamine how committed I was to political cartooning, and I finally admitted to myself that it had always been very difficult for me. I was never really very good at it.